The New York Times headline reads, Leading Republicans Join Democrats in Pushing Trump to Halt Family Separations. The online Washington Post headline reads, Growing number of Republicans urge Trump to change policy on separating families. Talk is cheap. “All that is necessary for the triumph of evil is that good men do nothing.” – Edmund Burke. The official line from the Trump White House is that critics of the administration’s practice of separating children from their parents at the border should simply change the law. The argument is indefensibly wrong: Donald Trump chose to implement a policy that separates these families, and he can change course at any time. But Democrats have more or less accepted the challenge anyway, and have proposed specific legislation to prevent the Republican president from keeping his current policy in place. Vox.com highlighted the Senate Dems’ effort to pass the “Keep Families Together Act,” which was introduced by Sen. Dianne Feinstein (D-Calif.). The bill would only allow undocumented children to be separated from their parents if there is evidence of parents abusing the children or children being trafficked. Separation could only happen after consultation with a child welfare expert. As of this minute, the proposal has 48 co-sponsors, which includes literally every member of the Senate Democratic conference. For all the talk today about Republican “discomfort” and “concern” over the president’s policy, no GOP senators have endorsed legislation that would require Trump to stop doing this – or proposed rival legislation of their own. All of which suggests Trump’s existing family-separation policy will continue until the president decides to stop doing this. Why are Senate Republicans complicit in this immoral, cruel and inhumane family-separation policy? Because in the personality cult of Donald Trump, loyalty to Dear Leader “trumps” everything else, including one’s soul. Holding children as hostages is evil, and Republicans are complicit in his evil. Americans are overwhelmingly opposed to this immoral, cruel and inhumane family-separation policy, except for one distinct group of Americans — you guessed it — members of the personality cult of Donald Trump. The GOP backs Trump on separating families at the border — which is all he cares about. A new poll from Quinnipiac University shows that the policy is unpopular among Americans — with one big exception. Two-thirds of the country, 66 percent, oppose Trump’s policy, according to the poll. That includes 6 in 10 men and 7 in 10 women. As is often the case, though, there’s a wide split by party. A majority of Republicans approve of the policy, while 6 in 10 independents and 9 in 10 Democrats oppose it. Put another way, the net view of the policy overall is minus-39, with Republicans at plus-20 — 20 percentage points more likely to support it than to oppose. Among independents, the net margin is minus-44 and among Democrats, minus-84. That’s a 104-point difference between Republicans and Democrats. We’ve seen this dynamic before in the Trump administration — often. Republicans broadly like Trump. Independents lean against him. Democrats hate him. That’s reflected in the polling on other immigration issues Quinnipiac asked about in this survey, such as Trump’s border wall: Republicans love it; independents lean against; Democrats hate it. The difference, of course, is that the policy at issue isn’t partisan in the way that a presidency is. Nonetheless, public perception to a large extent treats it that way. UPDATE: Steven Benen reports that a CNN poll released soon after this poll offered nearly identical results: 67% of American disapprove of the policy, while 28% support it. 58% of self-identified Republican voters in the CNN poll said they approve of the president separating immigrant children from their families. An analysis from Chris Warshaw, a political scientist at George Washington University, found that Trump’s family-separation policy is now the least popular federal policy in recent memory – with lower support than the Republicans’ tax cuts for the wealthy, the Republican plan to take health care benefits from millions of families, and even the president’s idea for a giant border wall. Immigrant advocates have long said that the children, primarily from Central America, are fleeing violence in their home countries and seeking safe harbor in the United States. But the Trump administration has used their plight to justify cracking down on [asylum] policies that allow these migrants to be released and obtain hearings before immigration judges, rather than being deported immediately. Trump warns against admitting unaccompanied migrant children: ‘They’re not innocent’ (April 2018). If Republicans can support such evil against young children, what other atrocities are they willing to accept and support from their Dear Leader? We have a dangerous element in this country, and it is not immigrants. 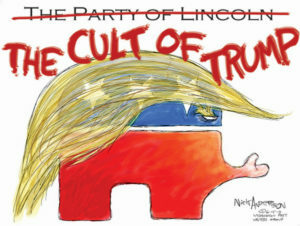 It is the members of the personality cult of Donald Trump. Dangerous from day one. …”If Republicans can support such evil against young children, what other atrocities are they willing to accept and support from their Dear Leader? It’s not about the “atrocities they are willing to accept”, it’s the atrocities they expect. Trump campaigned on civil rights and human rights violations. He said he wanted police to rough up suspects, to bring back waterboarding and “so much more”. To shut down the free press and to lock up his opponents. He praises murderers like Duterte, Kim, and Putin, while calling Trudeau and Merkel weak and dishonest. He’s doing exactly what he said he would, and it’s evil and unAmerican, and I hope he rots in prison.